An interior view of the Basilica of St. Paul’s Outside of the Walls, Rome. Pilgrimages have been taking place as long as people have had spiritual longing. I am currently on the latest Living with Christ pilgrimage, a trip to Italy called “Exploring the Roots of our Faith”. After landing in Rome yesterday, we headed to the ancient walled city, where we saw the heart of imperial Rome– the Palatine Hill, the forum, the Colosseum. Then we headed through Constantine’s triumphal arch to a Rome after the embrace of Christianity. Constantine’s mother Helena, of course, famously went on her own pilgrimage, to find the cross of Christ. And with her influence, her son Constantine gave official recognition to the early Church, ending the persecution of Christians and allowing the Church to grow and flourish. 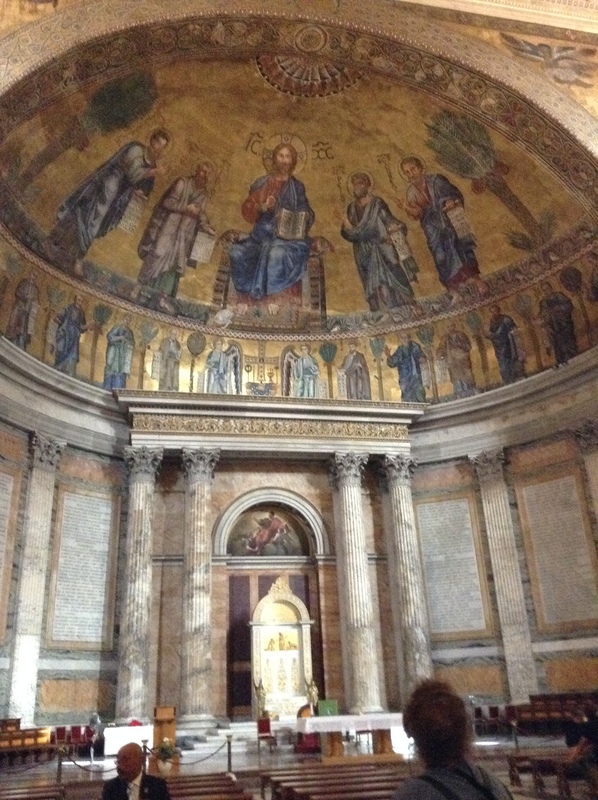 The highlight of the day was a visit to Saint Paul Outside the Walls, one of the four great basilicas of Rome. Everything here, from the towering statue of the ageing saint and a marvellous fresco over the altar to the glimpse one can receive of the crypt where Saint Paul is buried, reminded us of the importance of this man to our Church. And so our adventure began. Today, we are off to the Vatican. Ciao!